The joint opposition was desperately looking for a common candidate to (1) end, if possible, its divisive, internecine conflicts and (2) present a formidable and acceptable candidate who could stand up to the incumbent, Mahinda Rajapaksa. 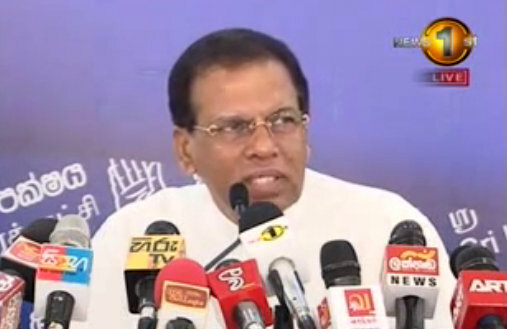 On Friday (November 20, 2014) the mystery candidate revealed himself : Maithripala Sirisena which the Opposition strategists calculate to be a coup because he was the General Secretary of the SLFP. They also took into consideration some of his Sinhala-Buddhist credentials which Ranil Wickremesinghe lacks. But can they achieve their goal by appointing Maithripala Sirisena as the common candidate? Or will they go into further disarray as events unfurl in the days ahead? Before going deeper into this aspect it is necessary to get our heads round what this election is all about. This election is not about constitutions. The issue of whether the current Constitution should be abolished or not, is a red herring. Though it is whipped up to a frenzy as the final answer to the nation’s current needs it is a non-issue. After the failure of three constitutions before (Soulbury, Colvin and JR) there is no guarantee that the next constitution, whatever it may be, is going to be the final answer. This election is based on the fundamental issue of whether to drop the pilot in mid-air or to fly back to the pre-2009 era when the Ranil-Prabhakaran Agreement, written by anti-Sri Lankan Norway, was dragging the nation to the depths of despair. Trying to draft ideal constitutions is like building castles on the sea shore: the next huge wave is bound to wash it away. After all, the British developed the mother of all parliaments without a written constitution, or a pre-existing model. It is the collective genius of the British that produced the Westminster model. Besides, Soviet Russia was supposed to have had one the best constitutions ever written. Where did it take the Soviet peoples who were under its jackboots? The constitution of the Weimar Republic – Dr. N. M. Perera wrote his second doctoral thesis on the greatness of it – collapsed under the ruthless forces of Hitler. Phillip Gunawardena, of course, argued that it collapsed under the theoretical weight of NM’s thesis! The emphasis on the legal framework of constitutions to regulate and act as checks and balances to maintain justice, law and order is highly overrated. It is not constitutions that really make or break nations. It is the people in command of whatever constitutions that are in place that make constitutions work and guide nations. It is the people who can make a constitution work or fail. The Greek city states were run by a variety of constitutions and Aristotle, who wrote a thesis on constitutions of Greek city states, went as far as justifying slavery – a common feature of Greek states. Plato condemned democracy though he, with all his theoretical knowledge, failed in his attempt to run a state. This is not to deny that there is no place for a constitution to define the limits of power in a state. But, by and large, amendments to the constitutions have been to increase the powers of the state according to the exigencies of the time. That does not mean constitutions must be changed like the way that Sirisena and Wickremesinghe change their underwear. In fact, all this talk about changing the constitution is irrelevant in solving the big issues of the nation. None of the proposed constitutions is going to solve any of the problems unless those entrusted with running and maintaining the integrity of the constitution are restrained effectively by independent institutions and intrepid individuals who will have the untrammeled authority and the power from the highest sources of the state to uphold the rule of law. However, what is relevant is the context in which the constitutional issue is defined by the common candidate, Sirisena. The joint opposition has identified the presidential constitution, designed and launched by JRJ, with Wickremesinghe voting for it, as the evil that should be destroyed. Following this line Sirisena says that he will abolish the constitution in 100 days and make Ranil Wickremesinghe the Prime Minister. But who will be the beneficiary of this process on January 8? Not Sirisena, not the joint opposition, not the nation. It will be only Wickremesinghe because he will be enthroned with the power that he couldn’t get by contesting Mahinda Rajapakse face-to-face. In short, Sirisena has come forward to dance in public according to Wickremesinghe’s drum beat. Incidentally, the biggest constitutional issue facing the nation, the issue of 13 plus or minus, is not even mentioned by Sirisena. Why? He avoids that issue and jumps straight into the irrelevant constitutional issue of abolishing the presidential system. This is meant to take the nation in a whole new direction. But he is faced with the complicated legal procedures and political land mines involved in abolishing the existing constitution and making Wickremesinghe the Prime Minister within 100 days. It means changing the constitution from the presidential system to the parliamentary system. If Sirisena can do it in 100 days it will be a bigger miracle next to that of President Mahinda Rajapakse defeating the Tamil Tiger Pol Pot. Probably, the 100 days limit was announced as an excuse not to abolish the constitution at the end of 100 days and postpone the issue sine die like the others. There is also the other the issue of whether Sirisena, in the unlikely event of his winning the presidential election, will willingly hand over power to Wickremesinghe to make him the Prime Minister. It will be like Siri Sangabo handing over his severed head to appease the wish of the peasant’s wife who was demanding the head of the king. So, what is at stake, more than anything else, will revolve round the central issue of who will be Numero Uno: Sirisena the elected President or Wickremesinghe the nominated Prime Minister? Political rivalries and the implementation of electoral promises will bedevil the post-election period along with the complex legal, political and constitutional issues. After all, Sirisena is not giving up his strategic position of being the General Secretary of the ruling party and his Ministerialship to hand over power to Wickremesinghe, eh? Despite his proclaimed pieties about presenting a clean administration, one of the major underlying reasons for his cross-over is his failure to get the premiership in Mahinda Rajapakse’s regime. Clearly, his ambition is to grab power, like all other politicians, and retain it in his hands for his good. Of course, there is nothing wrong with this because all politicians fight to win power for their own glory first and the people incidentally. So the plain question facing the electorate is this: if Sirisena is unhappy with President Mahinda Rajapakse not giving him the premiership will he be the next Siri Sangabo who will hand over his head to Wickremesinghe? As for Wickremesinghe, it is obvious that he has opted once again to back Sirisena after his failed mission to promote Sarath Fonseka. His record in either promoting himself or even his proxies has been dismal failure known to the electorate. This time too he is promoting an SLFPer, another non-UNPer, because (1) he knows that he can’t win power with the consent of the people, (2) he hopes to gain power through the backdoor by piggy-backing on a non-UNPer and (3), most of all, the majority Sinhala-Buddhist voters will not trust him as far as they can throw an elephant. The most humiliating and tragic plight of the UNPers is that they do not have a leader of their own to lead them into battle. What is the point in having a leader who can’t produce results? This is like a sterile father who has to borrow the seeds of another man and plant them in his wife’s womb to produce a child. When the UNP has to rely on outsiders to find a credible leader voters / UNPers have a right to ask whether they can trust either the UNP, their leader or their proxies and their promises. If elections are about making choices on policies, programmes and personalities why vote for proxies of a party that has been rejected by the people 28 times? If the UNP is seeking devious routes to get into power why should the electorate vote for its proxies? Wickremesinghe tried to creep in by hanging on to the stripes and pips of Gen. Fonseka. He failed. This is the second time he is trying by hanging on to the Sirisena’s tail. Can it work? The UNP is hoping to repeat their performance in Badulla. President Mahinda Rajapakse must be wishing the UNP more victories like that where the voting percentage dropped without removing the powers of the UPFA to run the administration. What is more, the euphoria of the opposition as if they have already won the election is rather premature. Many more factors have to fall into place before January 8, 2015 to claim victory. As of now, the alignment of the diverse forces is neither clear nor complete. As of now Mahinda Rajapakse still holds the upper hand. Time and again he has shown the capacity of snatching victory from the jaws of critical threats. His victories over Prabhakaran and Gen. Sarath Fonseka are convincing examples. In defeating Gen. Fonseka he crushed the joint opposition from north to south. Besides, there are no indications that he has lost the appeal nor the skills to recover and win under trying conditions. There are many grounds on which MR can be faulted. But there isn’t a single major reason why he should be defeated when he stands out as the greatest achiever of our time.